South Yorkshire referee Craig Pawson is to take charge of Monday’s FA Cup match at Cheltenham. Pawson graduated to Football League officialdom in 2008/09 and has already completed 15 appointments this season issuing a staggering 52 yellow cards and 3 reds. In late September he brandished 8 yellows in the Burnley v Millwall Championship fixture and more recently, 6 yellows and a red during the League 1 match between Hartlepool and Oldham. This Tuesday he took the Blackpool/Birmingham match issuing just two yellows. He will be assisted by Daniel Meeson and Jake Hillier with fourth official Keith Stroud. Back in September 2009 Pawson sent off Ryan Green right at the end of a game at Spotland after he 'pulled back' a Rochdale player. As it's now the end of the month it's time to see how well some Hereford United players have done trying to grow a moustache. Police have taken action to prevent any racist incidents at Whaddon Road this coming Monday after a teenager from Ross on Wye was fined for using his Twitter account to encourage fans going to the FA Cup-Tie between the Robins and Hereford United to sing a racist chant. The 17 year old admitted the public order offence and was fined £80 this afternoon. He has since apologised. “Gloucestershire Police, supported by Cheltenham Town Football club, will do everything we can to identify any individuals or groups that engage in racist chanting," said Superintendent Rob Priddy. "We will be there on Monday to assist the club in ensuring a safe and enjoyable match. "We expect the majority of supporters from both sides will enjoy the game and not engage in any form of offensive or abusive behaviour but we are taking action to prevent a small number from spoiling the match for everyone else." Hereford United director Dave Preedy watched this afternoon's Radfords Challenge at Edgar Street. "We've made £5K with the help of BlueSq and the lads who hit the target," said Preedy. "The assistant manager, Andy Porter, hit the target which doubled it up. "About 18 supporters take part. "The gaffer, Martin Foyle, had a go, wasn't very good but the assistant gaffer was very good. "He's a regular and he's just volunteered to help in the club which is very good." Preedy was very pleased with the afternoon and thanked everyone who came along. "It's what we're all about, we're Hereford! "That's why we will survive. Because we've got good people around. "Now we're all looking forward to Monday. Hereford United are £5,000 better off this afternoon thanks to supporters taking part in the Radford Challenge. One of the scorers, Kevin McCall, was later presented with a Signed Shirt. Also in the picture are Hereford United manager Martin Foyle and Alan Alger of BlueSq who kept goal during the event. Four supporters 'scored' and BlueSq, who set up the event, topped up the amount to £5,000. About 18 supporters took part in the challenge which was 'run' by Colin Addison. Meanwhile the Bulls have a new mascot. Wrexham's trip to Grimsby on Friday, December 21st will now be shown live on Premier Sports after their previously planned televised game between the Exiles and Luton was postponed. Conf South side Histon have released four players as part of cost-cutting measures at the Glassworld Stadium. Alfreton have recalled striker Tom Denton from his loan at Worksop Town. The 6ft 5in forward was a regular scorer in his six weeks with the Evo-Stik League side. Former Bulls keeper George Wood is reported to be on the verge of joining Crystal Palace as their goalkeeping coach. He was previously in a similar role at Blackpool. Southern League side St Albans have increased admission prices mid-season to £12 in a bid to balance their books. The move has seen Chairman Ian Ridley, formerly of Weymouth, quit the club. Watford have been charged with misconduct by the Football League after using a third-party loan firm in the sale of players. The Hornets are reported to have secured loans worth nearly £3million on future income from TV revenue and player sales without informing the League. AFC Telford have reported the first loss in their eight year history. The £35,000 loss is reported due to a drop in 'secondary income' and a £78,000 rise in player wages. Chairman Lee Carter, in his report to the club's AGM, told fans that the highest paid player at the club was now getting less than four years ago after the playing budget was cut 20%. Nuneaton have loaned forward Kyle Patterson to Worcester for three months after he started just two games so far this season. The Bulls have 8 returned tickets available for Monday's trip to Cheltenham. The tickets are available from the club office. 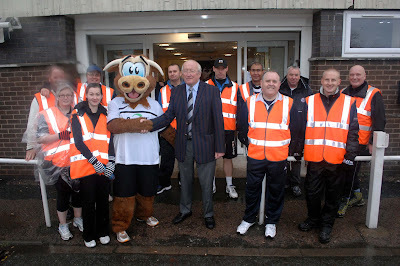 Hereford United supporters can take part in the Ronnie Radford Challenge at Edgar Street this afternoon. Arrive at the club from 1pm for a chance to win the Bulls £500. All you have to do is find the top corner of the net. Don't forget to wear a Hereford United shirt! Bulls’ fans make the relatively short trip to Twaddle Road on Monday evening for the televised second round FA Cup match against Cheltenham Town. This match is ALL TICKET for Bulls’ fans and the allocation is SOLD OUT. Recent visitors to Gloucestershire may be familiar with some of the strange habits of the natives but for first-timers, you will, almost certainly, come across the rather odd “self-pinching” that stems from the understandable disbelief at finding themselves paired with a nationally renowned cup fighting team like Hereford United. For this visit, Bulls fans are to be located in the Hazelwood Stand, which is all seated and behind one goal and also part of the In2Print Stand to one side of the. PLEASE NOTE – Cheltenham often insist on RESERVED SEATING, which suggests that you will need to sit in your allocated seat. Fans who visited four seasons ago will recall the chaos that followed the shambolic pre-match stewarding and you are therefore advised to arrive in good time to find your seats. HUISA – Coaches depart from Radford’s at 5.00pm with a fare of £12. Seats can be booked through The Club office (08442 761939). BY CAR - My suggested route is perhaps not the shortest but should provide a fairly trouble free journey. From Hereford, drive to Ledbury then follow the ring road to the end to join the A417 to the M50. Join the M50 easterly (sign M5) and continue to the M5 where you take the southbound carriageway (sign The South West, Tewkesbury, Bristol). Leave the M5 at J9 (sign Evesham) joining the A46. At the third set of lights (approx 2 miles) turn right for Cheltenham and right again at the junction onto the A435. After passing through Bishops Cleeve, you will enter Cheltenham with the Racecourse on your left. At the roundabout, take the third exit onto Evesham Road and then turn left at the lights into Wellington Road. Take the second exit at the next roundabout into Prestbury Road then first right into Whaddon Road. This route avoids driving through the centre of Cheltenham. Distance is about 45 miles and you should allow an hour. Postcode GL52 5NA. PARKING – at the ground is reserved for permit holders but there is parking at the nearby Parklands Social Club (£4). Continue past the ground on Whaddon Road and take the next left and then first left again. There is not a lot of street parking close to the ground and it is uncertain if the park and ride from the Racecourse car park will run in the evening (I’ll update if I get any further info). ALEHOUSES – The Kemble in Fairview Street remains my favourite Cheltenham haunt but The Sudeley Arms and The Conservatory in Prestbury Road are within walking distance. The local ‘Spoons is The Moon Under Water on Bath Road. CHIP SHOP – There is a decent chippy (The Pittville) on Prestbury Road between the Sudeley and the Conservatory. Jon Hales, who organised the very successful walk by Hereford United supporters last weekend, has released details of how to turn those pledges into cash. Thank you to everyone who pledged money towards the Sponsored Walk. It has been a massive success and we are looking at a figure over �7,000. Now comes the hard bit - collecting in all the money so we can present the club with one cheque (at the Newport game on 29th December). 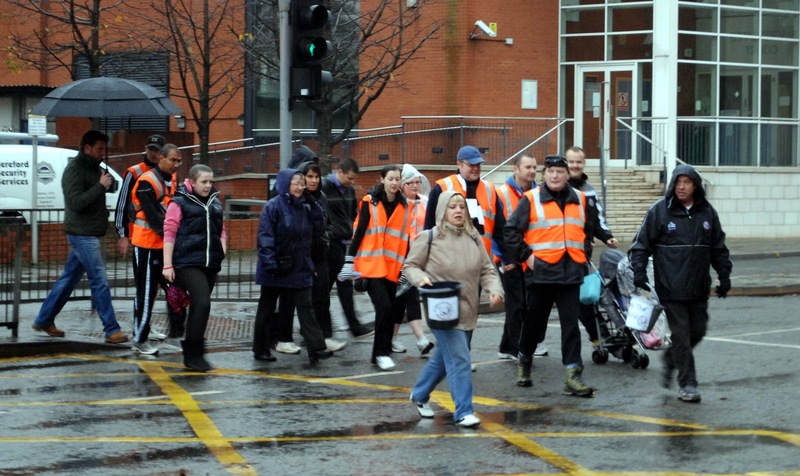 If you are paying for a pledge that was made directly to one of the walkers please include their name where possible. If it was a general pledge made through me (JonHale) /facebook/twitter/BB/TME etc then your pledge will be on the 'master' sheet which I have. Thanks again to all supporters who donated, to the car drivers who tooted (and cost me �50!! ), to the drivers who stopped and gave us money en route, to Hill Top Cafe at Fromes Hill, to the lovely family who waited in the rain with cakes and biscuits at Whitestone, to those who waited at Aylestone Hill for us and those in High Town and at the club. Special mention to SFT Xpress and Rosie Styles for their brilliant support along the way. It was an unforgetable day with a team of incredible people doing what we do best - sticking together and helping HUFC. Any questions feel free to email me. Cheltenham Town manager Mark Yates has spoken about the visit of Hereford United to Whaddon Road next Monday for the FA Cup-Tie. "In many ways there are lots of positives, it's a home game against a team from a lower league but we won't be taking them for granted.," Yates told the Cheltenham OS. "We know the record they have against us, even since I've been here I don't think we've been able to beat them. They've got some good players, they've been on a good run. Martin's done a really good job there in what sounds like really difficult circumstances. They'll be as clued up as any other team will be, as switched on as any other team would be against us. They'll be well supported and we've got to match that and their support from the terraces, for the fans to get behind the players and look forward to what will be a decent game of football. "The game on Monday alters the week slightly, we managed to get a few really good days into the players early in the week and we've staggered some of the days we've had off. "I don't think it being a cup game makes any difference, the fact we don't have good records against certain teams, it's a different set of players and circumstances. Our record against them isn't something that will be bothering us. "Former Cheltenham players will just add to the flavour of a local-ish derby anyway, it will be good to see them. They'll have bits on us but it's two different teams. We'll just concentrate on our boys and make sure we carry on our preperation properly. We'll go out there and play to our maximum. "It's about the two teams going out there, both managers will say they're as prepared as they can be, you have to deal with any injuries you might get or any suspensions we have. We don't disrespect anybody, we don't take anybody lightly and that gets drilled into the players." Former Bulls loanee Lee Collins has left Shrewsbury after they opted not to extend his loan into a third month. The Barnsley man played 10 times in two months for the relegation candidates. Grimsby chairman John Fenty says the club has to move from Blundell Park as the current stadium is not viable to upgrade due to it's unwelcoming location next to the Humber, meaning fan numbers would not increase if better facilities were in place. Wrexham Supporters Trust chairman Pete Jones says he doesn't regret them taking over the club, a year after it happened. He praised the local community, while adding: “One of the main aims was to make the club sustainable, that is one of the most important things we got form Supporters Direct, that they want for clubs.” Former Bulls loanee Darren Randolph has been handed a two match ban after being reported to the SFA over a kick aimed at an opponent that was missed by the match referee. Former Bulls striker Nathan Elder has been named the Conference Player of the Month for November. The 27 year old scored five times in four games in the month. Lincoln manager David Holdsworth has won the Conference Manager of the Month award. The Imps won all three of their Conference matches during the month as well as knocking Walsall out of the FA Cup. Former Bulls striker Danny Davidson has moved from Coalville Town to Loughborough Dynamo. The 33 year old nomadic forward has swapped the NPL First Division South sides after struggling for games this season. Former Bulls loanee Richard Peniket has been recalled from his loan at Kidderminster after failing to start a game for two months. The teenager made 11 Conference appearances for the Harriers, but started just five of them. Macclesfield have loaned striker Arthur Gnahoua to Whitehawk until January. He is the second Silkmen player to join the Ryman League side without having played for Steve King's side since a summer transfer. Hereford United's Brian Smikle says that the great team spirit at Edgar Street has keep everyong going through the recent difficult times at Edgar Street. "The team spirit has kept us going really and we played our hearts out to beat Shrewsbury in the last round of the FA Cup," Smikle told the Western Daily Press. "We are only have 17 players at the moment and I've never been at a club in a position like this before, but we will all dig in and stick together. "We've all dealt with it and focused purely on the football, but we all know how important the Cheltenham match is going to be for the club, especially if we can make it through to the third round. "It was a strange feeling when the draw came out because we had a fairly local derby match against Shrewsbury and I didn't think for a minute we'd have another one in the second round," Smikle added. "It's a very good draw and everyone knows Hereford have a good record against Cheltenham, so we want to keep that going. I loved my time there and I am still in touch with a lot of the lads. "It will be the first time I've come up against a team managed by Mark Yates, who I played for at Kidderminster and Cheltenham and I am looking forward to the game. "I know Gallers is pumped up for this one and it will be good to see all the lads, but when the match starts we'll be fully focused on doing well for Hereford. "Cheltenham have been flying in the league and there hasn't been much banter flying around yet, but I am expecting a few sly texts in the next few days!" The Bulls have just 15 tickets left for Monday's trip to Cheltenham. The bulk of the 1,353 tickets have been snapped up, leaving a small number left available when sales continue from 9am tomorrow. ESPN analyst and former England winger Chris Waddle thinks a win for Hereford United at Cheltenham in the FA Cup could help them get back in the Fotball League. "The Cup is still made of dreams and Hereford have nothing to lose," Waddle told the Hereford Journal. "For players it's a chance to put themselves in the shop window. "And for clubs it's an opportunity to earn some good money. "For a club like Hereford it could help them get back in the Football League. "It's the best domestic cup competition in the world and I look forward to it every year." Hereford United director Grenville Smith has said that the proceeds from last Thursday's Sportsmans Dinner had exceed his expectations. "Our projected profit is £8,146 and we also have the bar takings," Smith told the Hereford Times. "I'm absolutely over the moon. "I had hoped for £5,000 but to get more than £8,000 is tremendous. "Andy Morris (Westfields) extracted every last pound at the auction. "I could not believe some of the prices he was getting." Hereford United have been given ball number 56 in next Sunday's FA Cup draw. The Third Round draw itself will be made by Fabrice Muamba and Ledley King at Wembley Stadium. They will pick out the 64 balls to produce 32 ties and the draw will be shown live by ITV1 and the FA.com at 2.40pm. 21 Leeds United, 22 Leicester City, 23 Liverpool, 24 Manchester City. There are less than 100 tickets left for Monday's trip to Cheltenham. More than half of the remaining tickets available at close of business last night have been snapped up in the opening two hours of business today. Anyone needing a ticket is advised to contact the club ASAP as they are expected to sell out shortly. Update: At 1pm, just 25 tickets remained. Mansfield boss Paul Cox has received the backing of chairman John Radford after the Stags crashed out of the FA Trophy with a 2-1 replay loss to Matlock Town last night. Luton's televised match at Newport next Tuesday has been postponed after they drew with Dorchester in their FA Trophy match last night. The Hatters will now host the Conf South side twice in four days having also been paired together in the FA Cup. Stockport have agreed a deal with the owners of Edgeley Park to reduce rent payments at the ground. The Hatters will pay 65% less than their current deal and will take over day-to-day running of the ground from Cheshire Sports. Coventry's rent arrears at the Ricoh Arena are set to top £1million this weekend. Talks over a payment deal are reported to have stalled, with the club's owners trying to buy a 50% stake in the stadium. Nuneaton loanee Kevin Malaga has rejected the opportunity to stay at the club for a second month. The Coventry defender played five times in his month at the club. Football Conference sponsor Blue Square Bet is giving Hereford United an FA Cup themed cash boost ahead of their local derby clash with Cheltenham Town next Monday. The bookmaker is challenging fans to recreate Ronnie Radford's iconic 1972 FA Cup goal against Newcastle and for every fan who finds the top corner they'll pledge £500 towards the club's future. Hereford boss Martin Foyle will be joined by club legend Colin Addison, player/manager from that famous day forty years ago, to kick off The Ronnie Radford Challenge in style at Edgar Street this Friday (November 30th). Blue Square Bet PR Manager Alan Alger said: "Ronnie Radford's goal against Newcastle is arguably the ultimate FA Cup moment and as title sponsor of the Football Conference we wanted to celebrate this and make a positive difference to the club's current financial situation at the same time. "We're encouraging as many fans as possible to enjoy the chance to recreate Ronnie's goal and help their club out." from Blue Square Bet and it promises to be a day to remember for the club ahead of our crunch FA Cup tie on Monday. "We're asking fans to join us on Friday and encouraging them to bring their boots and of course wear their Hereford shirts. Fans should report to the club reception desk from 1.00pm to register." Blue Square Bet make a 2-1 Hereford victory over Cheltenham, a repeat of the scoreline on that famous day 14/1. Whilst any Hereford player to score from outside of the area against Cheltenham, repeating Ronnie's feat is 3/1. The Bulls are down to their last 200 of 1,300 tickets for Monday's FA Cup match at Cheltenham. General sales will continue through this week and to Monday at 1pm, or until sold out, with more than 80% of the allocation already gone. HUISA also have around 20 spaces on their sixth bus available. Bookings for it can be made via the club office on 08442 761939. The Hereford Admag has partnered with Hereford United FC to produce a special publication that charts the history of the Bulls from the early 1920s through to the present day. Articles and photographs have been written and supplied by club historian Ron Parrott, and compiled into a fascinating 48-page full colour newspaper that has been published and printed by the Admag. It is priced at £1.50 with a contribution to club funds from every copy sold. Copies are available from 28th November from the club, at the Admag offices and at selected retail outlets. It will make a great Christmas present for any Bulls' supporter! 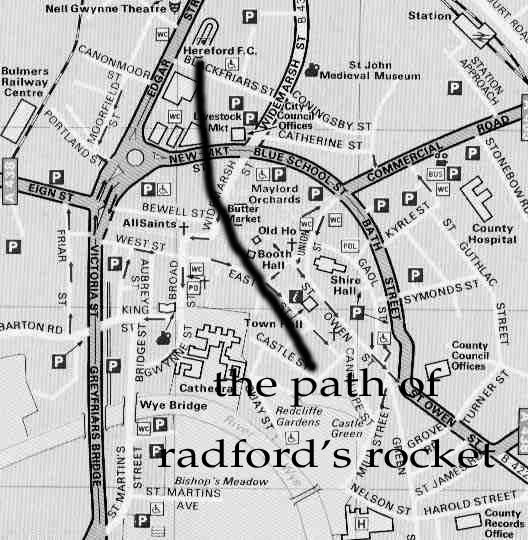 Meanwhile, Ron Parrott would like to say a special thank you to two supporters who have been very generous in their sponsorship of Ron for this weekend's Sponsored Walk from Malvern back to Edgar Street. Roger Lundberg from Denmark has been a good friend to Hereford United over the years and often sponsors a match ball when he's over for a game. Likewise, Bernd Schulz from Germany tries to make it over at least once a year and both gentlemen have been subscribers to Ron's programme subscription service for many years. Ron commented, "It's really gratifying that supporters from the continent can take the time and trouble to come to our rescue in our time of need and we all look forward to seeing them at Edgar Street again before too long!" Gateshead have switched their home game with Newport this Saturday to Newport's Rodney Parade as their International Stadium home is currently waterlogged. They do not expect conditions to improve before the weekend, and will switch fixtures with the Exiles now travelling to Gateshead in February. The Heed have also extended the contract of midfielder Ryan Donaldson to the end of the season after the former Newcastle trainee initially penned a deal to the end of December. Braintree are facing a fixture backlog after Saturday's FA Trophy game, rearranged for tonight, was postponed for a second time due to their ground being waterlogged. The match will now take place next Tuesday, cancelling their game with Forest Green. Tamworth have allowed striker Jean-Paul Marna to leave by mutual consent. The Frenchman is to return home after being sidelined by injury for most of the season. Last night's FA Trophy replay between Chelmsford City and Hampton and Richmond was postponed due to the weather, leaving the Bulls still awaiting news on which one they will face. Chelmsford's Melbourne Stadium was deemed unplayable after the heavy rain over the weekend. A new date for the tie is yet to be determined. Update: Tie to be played December 3rd, 7.30pm, while the Bulls are in action in the FA Cup. Members of the HUISA Committee met with representatives of the group investigating the possibility of forming a Supporters Trust last night. It was agreed that HUISA would investigate the matter further and a joint meeting with Supporters Direct will be arranged in the coming weeks. Yes you read the title right that proud Lancastrian club Wigan Athletic once took part in the Herefordshire Senior Cup. It’s only 140 miles down the M6 from Wigan to Hereford so something of a local derby? Clearly it is for here’s the proof that Wigan did indeed compete for the Herefordshire FA’s premier cup competition. Why and how did this happen? Well it’s not so strange actually because the Herefordshire Senior Cup was an invitational tournament that first took place in 1951. Details are a bit sketchy but it would appear that it was set-up to give Hereford Utd a cup to play for and to provide some revenue for the HFA. The first invited team was Shrewsbury Town who promptly beat the Bulls 3-1 to become the first holders. The Herefordshire FA then decided to make it an open competition and up to eight teams from Herefordshire and the surrounding counties took part. Hereford Utd failed to make the final in the four seasons it was an open competition. Merthyr Tydfil won it twice, Worcester City once and then in 1955 the two finalists Stourbridge and Kidderminster could not agree on a date to play the final. With both teams outside the jurisdiction of the HFA the issue couldn’t be resolved so the final was declared null and void. From 1956 the competition reverted to an invitational final with the first invitees being Merthyr Tydfil who at the time were a powerful and highly successful Southern League club who during the late forties and early fifties regularly applied (without success) for election to the Football League. Hereford beat them to win the cup for the first time and then for each of the next five seasons Newport County were the opposition for Hereford. Newport were in the third division at the time whilst Hereford were in the Southern League with ambitions of being elected to the Football League of their own. Hereford more than held their own in these games against the third division side who usually sent a full strength side, winning the cup three times to Newport’s two. In 1962 fourth division Oxford Utd took over as the opposition and the HFA, in an attempt to squeeze more revenue from the competition, opted for a two-leg final. The games proved difficult to arrange and the cup was not played for in either 1963 or 1964. Though it did return to the fixture calendar in 1965 and 1966 with Oxford winning both times to notch a hattrick of wins. The 1967 competition reverted to a single final game and this time the visitors to Edgar Street were fourth division Port Vale who were seen off 2-0 as Hereford lifted the cup for the fifth time. The HFA pulled of something of a coup for the 1968 final as second division Charlton Athletic agreed to play. The Londoners ran out winners with a 3-2 victory after extra time. From 1969 the final again was played over two-legs with Newport County returning as opposition after an eight year break. Hereford battered them 8-4 on aggregate scoring four goals in each leg. The next two seasons saw Worcester City take on the Bulls with the Edgar Street side victorious on both occasions. This is a picture of Hereford skipper Mick McLaughlin with the Herefordshire Senior Cup after the 5-4 2nd-leg win. Won with a last minute winner after hereford had trailed 3-1 early in the second half. Which all brings us to the game against Wigan Athletic in 1972. Wigan were a top non-league side at the time and had made numerous attempts at election to the Football League. Indeed they have more unsuccessful applications than any other club and it was this seeming reticence by the Football League to admit them that led them in 1972 to make an audacious if unsuccessful bid to join the Scottish Second Division in their quest for league football. The first leg of the Senior Cup had been played earlier in the season at Springfield Park and the two teams had played out a 1-1 draw. I’m not sure of the result from the second leg but Hereford won it to cap off an amazing season. They’d had a fabulous and famous cup run which saw them draw 2-2 with Newcastle Utd at St James Park before winning the replay at home 2-1 after being a goal down. Ronny Radford’s 30 yard 85th minute equaliser is still to this day shown on TV and for many epitomises the magic of the FA Cup. Unfortunately for Hereford the magic didn’t last for they were knocked out by West Ham in the next round but their stock was riding high. They finished the season as runners up in the Southern League and after fourteen attempts at election to league they finally achieved and took their place in division four for the 72/73 season. BN would like to thank Corfu Bull for finding this article which originally appeared on http://footysphere.com. Ebbsfleet's Paul Lorraine has been given a three match ban after being sent off early in the second half of their game against Hereford United last Saturday. There had been some speculation that manager Liam Daish might make an appeal after watching the DVD of the game but it appears he decided not to. Lorraine will next be available for selection on December 22nd which just happens to be the date of Ebbsfleet's Conference home game against Hereford United. 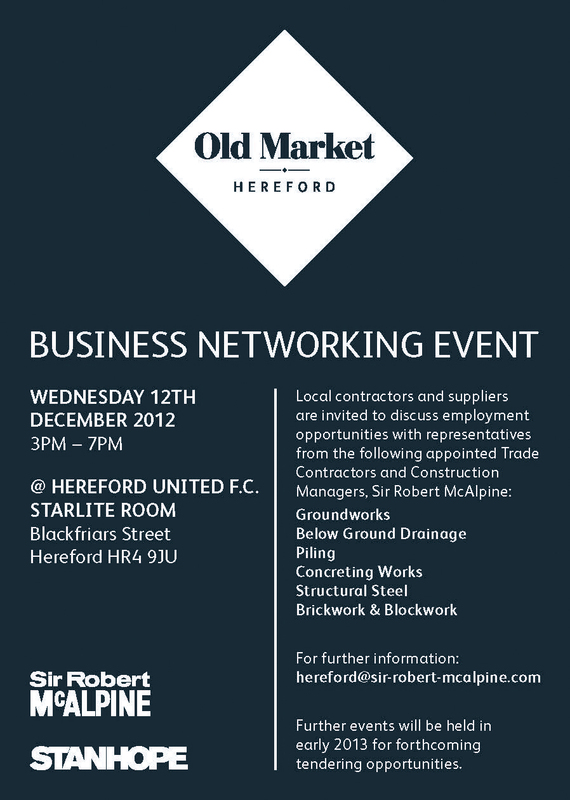 On December 12th Hereford United's Starlite Rooms is the venue for local companies looking for work at the former livestock market development. Stanhope and Sir Robert McAlpine have invited local businesses interested in working on the project to the event which will have full details of works that can be tendered for. Included is groundworks, below drainage work and concreting. The event is from 3pm to 7pm. Hereford United have been drawn at home to either Hampton and Richmond Borough or Chelmsford City who replay their first round tie tomorrow evening. The tie will be played on Saturday December 15th with a 3pm kick-off. Hereford last met Hampton in the Trophy in 2002 when the Bulls won the game, at Edgar Street, 4-1. It's not thought that the Bulls have ever faced Chelmsford in the Trophy before. Although the tie is at ES, it's unlikely that there will be much 'profit' from the gate which is shared after expenses. Winning the tie is worth £6,000. The draw for the second round of the FA Trophy takes place later this morning. Hereford United are in the draw having defeated Ebbsfleet 1-0 last Saturday. The second round ties will take place on December 15th. A few prices for next Monday's FA Cup match at Whaddon Road have been released. To date the top quote for a Hereford win is 5/1, that's with SkyBet. Top price for a draw/replay is 14/5 with Boylesports. Ebbsfleet manager Liam Daish wasn't sure whether Paul Lorraine should have been sent off after an off-the-ball incident with Hereford's Kyle Perry. "Costly decision and someone's at fault," Daish told BBC Radio Kent. "I just looked back and there was obviously something that had happened. "The first thing I looked at was the linesman flagging. "You look over and it's Paul Lorraine and Kyle Perry and I hoped it wasn't going to fall on our side where it was going to be Lorraine that was spoken to. "But it was, he went off. "Give benefit of the doubt. "Hopefully it's been filmed and I can watch it. "I'll be very disappointed if it's Paul's fault. "As soon as I've seen it, I'll know if there was intent." Last season when Perry was playing for Lincoln, Lorraine was sent off. "That's his (Perry's) game, that's what he does. He's done it all through. "To me he's not good enough as a football player. "He wants to get you, he wants to be controversial and if you get players that buy it then anything can happen but he was never a danger for us. "I suppose he's done his job, what he wanted to do, whatever. "We've out of the trophy and it's left a sour taste in my mouth whatever happened. "One way or another the DVD going to show me what the exact incident was. So whatever reason it is, or who ever is at fault is going to leave a sour taste." Other than the goal for Hereford and the fox element, the main talking point from Ebbsfleet yesterday was the hand-bags between Kyle Perry and Paul Lorraine which saw the latter red-carded. The incident took place off the ball and therefore off camera. However Five Live caught up with Perry on the way back to Hereford and asked him what had happened. "It wasn't very pretty but we got the victory," said Perry. "Terrible conditions but we got the job done." Lorraine was sent off in the second half. "It was a fore-arm smash on myself. "The game was a bit of a rough and tumble. A lot going on. Elbows flying about the place. "The guy lunged in and then we went face to face and he's raised his arm. "The linesman saw it and got him sent off. "The game changed from then on really because they'd pretty much had the advantage." Perry was reminded that it wasn't the first time he had clashed swords with Lorraine. "I wouldn't be going on a night out in Ebbsfleet. "The last time I was there, I got his mate, once again an argy-bargy with him. He took things into his own hands and he got sent off as well. "That's part of my game. "I was very aware that Liam Daish (the Ebbsfleet manager) was rather hostile with me at the end of the game so I had try and stay away from him because he's a big bloke as well. "I like to get under player's skins, I like to affect the game in whatever way I can." Josh O'Keefe scored the only goal of the game at Ebbsfleet yesterday and afterwards he spoke to BBC Hereford and Worcester. "I've not scored for a while to be fair," said O'Keefe. "I think I tackled the defender, managed to get the ball back and turn and get the shot away. "To come to somewhere like this and get a win in the League or the Cup is brilliant. "We stayed in as very nice hotel and prepared right. "It was my first away trip so I had to sing. "I started off then Phil Marsh and Kyle Perry sang as well." Bulls Missed Out On Owens? Today's Non-League Paper reports that the Bulls made a move to sign Mansfield defender Andy Owens. The 23 year old opted to return to former club Southport, telling the paper: "I was told there was interest from Chester, Hereford, and Cambridge as well but I know all the lads at Southport which swayed it for me." A few pictures of the Hereford United supporters walk which started in Malvern and finished at Edgar Street. The first two were taken after the walkers had breakfast which was kindly supplied by the cafe at Froomes Hill. The others were taken in Hereford. 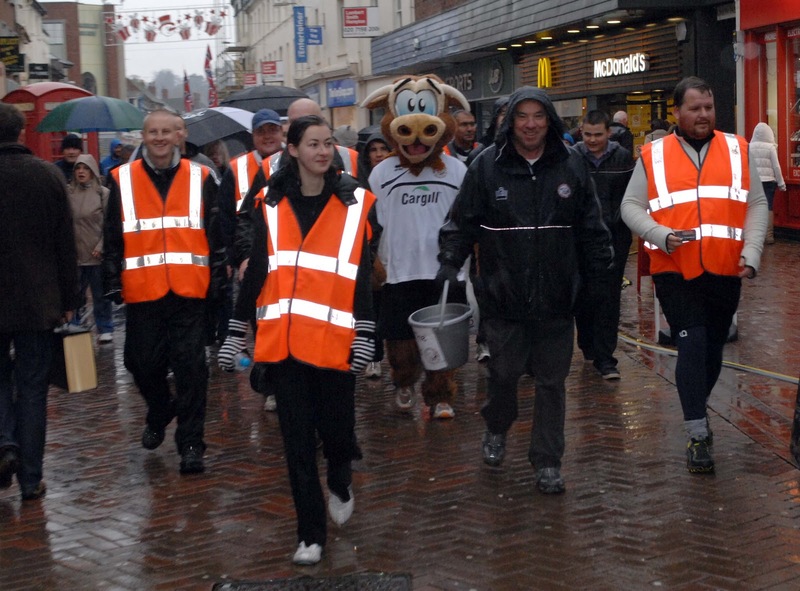 After the walk ended Jon Hale told BBC Hereford and Worcester that all the walkers had made it to Edgar Street. "It's been an incredible experience," said Jon. "It was very dark and cold and misty when we started at 6.30am. "It was dry until about 14 miles in. "Going around High Town it got a bit heavier so we were keen to get back, have a shower and get warm." Despite, in his words, not being at the races in the first half, Hereford United manager Martin Foyle was delighted to have got through the first round of the FA trophy at Ebbsfleet this afternoon. "Delighted to get through to the next round, that's what cup football is all about," Foyle told BBC Hereford and Worcester. "I thought they probably deserved something out of the game. "The sending off changed the game in terms of them being down to ten men which gave us an added advantage. "Then we started to play some good football. "However we started the game with some poor decision making." Foyle made several changes to his starting eleven. "I had to. I travelled here with 16 players. "Then Marley had a little tightness in his groin so I didn't risk him so we're down to 15. "I had to give some players some game time, Perry, Marshy and Junior needed it. "Heath is on four bookings. "But we've got to get on with it until the January window." Paul Lorraine was sent off after an off the ball incident with Kyle Perry. "I was staring at it. "He's caught him, whether it was as bad as it was made out to be I'm not too sure. "The linesman flagged straight away." Foyle was reminded that the squad has a week off. "Thank God for that. Seriously. "They've just set themselves up for a good cup-tie at Cheltenham. "I don't know what the side will be." Two players might have joined the Bulls last week but the deal fell through. "It was too late. I did have two players lined up by 3pm ready to come and then one of their players pulled out their side and the whole deal collapsed." To end with Foyle thanked supporters for all their recent help. "You'd be surprised what is going on in and around the club. "We had the dinner on Thursday night which was absolutely fantastic, brought some great revenue into the club. "Also the supporters stood in that rain and it's been rain non-stop. "Everyone is pulling together. It's good at the moment." It's been a much better week for the Bulls. There's been an agreement made with HMRC, the transfer embargo has been lifted, the walkers have raised over £7K and finally this afternoon's Trophy win is worth £5K. Chairman David Keyte was pleased. "It was important the tie was settled," Keyte told BN. "We didn't want a replay. "The idea today was hit or miss. "Try to get it done today. "I thought they worked very hard, horrible day, horrible conditions. "And when their player was sent off they ignited a bit on the reaction to that. "We played well especially the last fifteen, could have had a second. "It's been a good week for the club. "We can now focus on the Cheltenham match in the FA Cup and possible glory there. "But this could well be the win that gets us through to Wembley. Unlikely striker Josh O'Keefe came off the bench to fire Hereford into the second round of the FA Trophy. Bulls fans battled through hours of rain to make it to Stonebridge Road, although the away followed was reduced as supporters took part in the fundraising trek from Malvern to Edgar Street, bringing in vital funds for the club. There was no segregation, so no official figure of how many Hereford fans were in the crowd of 651. Before kick off, Martin Foyle had said that top scorer Ryan Bowman was missing through injury. He initially made five changes, with Marley Watkins returning on the right wing after injury. Harry Pell, Brian Smikle, Kyle Perry and Phil Marsh also started, with Simon Clist, James McQuilkin, Sam Clucas and Josh O'Keefe dropped to the bench. Then 15 minutes before kick off, we got news that Watkins didn't feel 100% in the warm up, so Clucas started after all. Chances in the first half were few and far between. Smikle had the best one for Hereford on four minutes, when he scooped over at the far post after a good cross from Clucas. At the other end, Ebbsfleet didn't really test James Bittner. Ebbsfleet could've gone in front with four minutes of the first half remaining. A Lanre Azeez corner was headed onto the inside of Hereford's post by Luke Graham, and thankfully Bittner was there to smother the loose ball. Hereford never really got going in the opening period, but neither did Ebbsfleet. The most interesting moment was when the game was stopped for a couple of minutes so that fox excrement could be removed from the side of the pitch. The second half started as the first half ended, with Ebbsfleet dominating. Azeez again provides a decent cross which Hereford dealt with, but moments later the home side were down to ten men. With most eyes in the Hereford area, a scuffle broke out at the other end between Kyle Perry and Fleet's Paul Lorraine. The defender appeared to strike out at him, and the assistant flagged furiously. The referee ran the length of the field and then sent him off. He was still protesting as he was being led down the tunnel. That was Hereford's cue to improve, but the home side continued to push. They had a shout for a penalty, and Andy Gallinagh cleared another ball off the line. Tom Phipp had a good shot from 20 yards too, which Bittner pushed behind for a corner. Then Martin Foyle made changes. Perry was brought off for O'Keefe who made an impact up front. With eighteen minutes to go, he found space on the edge of the box, turned well and drilled into the bottom corner. Finally, a Hereford goal. The Bulls grew in confidence. Clucas fired a decent ball across the face of goal, and then did well in the dying stages to retain possession. This was not a memorable encounter. It won't be etched in FA Trophy folklore for years to come. But the record books will show a Hereford win, and that's good enough for me. Hereford United: Bittner; Gallinagh, Graham, Stam, Heath; Clucas, Pell, Evans, Smikle, Marsh (McQuilkin 76), Perry (O’Keefe 63). Subs not used: Hanford, Clist. Ebbsfleet: Edwards; Stone, Walsh, Lorrain, Howe (Greenhalgh 80), Azeez, Carew, Barrett (Ada 53), Phipp, Godden, Enver-Marum. Subs not used: Menz, Blake,Bellamy. Few stats from this game. Suffice it to say it was wet and three Hereford players were booked. They were Joe Heath, Sam Clucas and James Bittner.